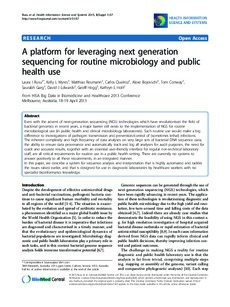 Even with the advent of next-generation sequencing (NGS) technologies which have revolutionised the field of bacterial genomics in recent years, a major barrier still exists to the implementation of NGS for routine microbiological use (in public health and clinical microbiology laboratories). Such routine use would make a big difference to investigations of pathogen transmission and prevention/control of (sometimes lethal) infections. The inherent complexity and high frequency of data analyses on very large sets of bacterial DNA sequence data, the ability to ensure data provenance and automatically track and log all analyses for audit purposes, the need for quick and accurate results, together with an essential user-friendly interface for regular non-technical laboratory staff, are all critical requirements for routine use in a public health setting. There are currently no systems to answer positively to all these requirements, in an integrated manner. In this paper, we describe a system for sequence analysis and interpretation that is highly automated and tackles the issues raised earlier, and that is designed for use in diagnostic laboratories by healthcare workers with no specialist bioinformatics knowledge.